Two dry dives are available: to a depth of 40 metres or 50 metres. The divers fill in a self-declaration medical form. Any questions ticked YES must be covered by a Dive Doctor's clearance form. (These can be done at MDC with enough notice). Divers change into scrubs (provided). After a briefing, divers (maximum of 10) enter the chamber accompanied by an MDC supervisor. The chamber is compressed to 40m. After maximum bottom time is reached, decompression begins. At the end of the session there is a post-dive briefing plus time for questions and logbook stamping. The chamber is compressed to 50m. 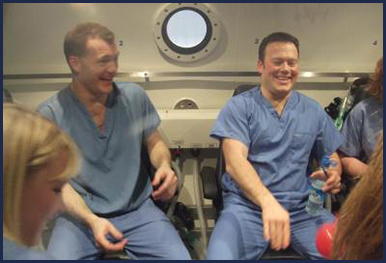 Divers decompress on a 100% oxygen. 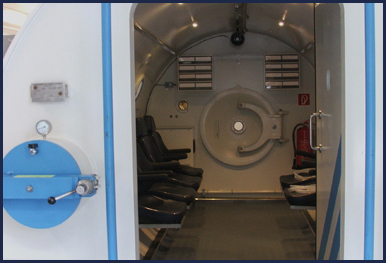 On coming out of the chamber there will be a post-dive briefing and time for questions and logbook stamping. A minimum of 6 divers is needed to dry dive up to a maximum of 20. Cost per diver is £30.00 for the 40m dive and £40.00 for the 50m dive. Divers must be at least 18 years old for insurance reasons. Divers must bring along a certification card or logbook so it can be sighted by chamber staff. 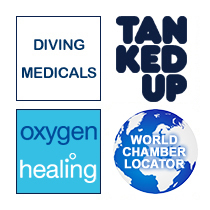 Any individual who requires a diving medical to dive, must bring it along so it can be sighted by chamber staff. To find out dates when the Midlands Diving Chamber is running Dry Dives, please click here.